Relatives of some of the Kingsmills victims have told a coroner they will no longer cooperate in dealings with An Garda Síochána (Irish police) until a new law is passed in the Republic of Ireland. The legislation would allow the Northern Ireland coroner to question gardaí on the County Armagh murders. Ten Protestant men were shot dead in their work van on 5 January 1976. The murders have been blamed on the Provisional IRA. On Friday, the victims' families said they have "come to the end of the road" because of slow progress on the inquests. Part of the problem stems from the fact that members of the gardaí are currently legally prevented from giving evidence in Northern Ireland courts. However, in December 2017, Dáil Éireann (Irish parliament) published draft legislation to facilitate co-operation by gardai with UK coroners' inquests examining Troubles-related deaths. The coroner assured the families that he would write to the relevant authorities in Ireland expressing their anxiety over the issue. He said if it was in his gift, the law would have been in place by now. Speaking after the hearing, Colin Worton, whose brother Kenneth died in the attack, said some of his own family believe the search for justice has been so lengthy, it is not worthwhile continuing to attend the inquest. He accused the authorities in the Republic of "dragging their feet" and said the change in the law needs to happen "sooner rather than later". 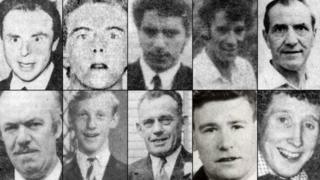 The families also expressed frustration that in England, IRA suspects in the Birmingham pub bombings have been named in that inquest, but the same has not happened in the Kingsmills case. Mr Wharton said those responsible should "tell why and who did it", adding that they should be "man enough to have a back bone and stand up and face the consequences". The coroner repeated his calls for those with information to assist in the inquest. The hearing will resume on 17 May.